When the Wanderer (Venus in Sagittarius) and the Homebody (Mars in Taurus) meet, they’ll have difficulties adjusting to each other’s rhythms. However, both partners share a lust for life that can help them create one of the most abundant relationships around. Venus in Sagittarius is always looking for a new adventure. Dynamic and passionate, she brings the whole package to a relationship as she engages her partner on physical, spiritual and philosophical levels. She is the eternal optimist who buoys a relationship along through sheer force of will. Easily bored, she needs a lover who matches her enthusiasm or she will look elsewhere. Ms. Sag can be deliciously laid back (even careless) when things are going smoothly. But this will change if her partner ever challenges her beliefs. Venus in Sagittarius needs to be right and will zealously defend herself as she hammers her point home. Mars in Taurus likes to take things slow. Deliberate and determined, he is a sensual lover who knows what he wants. He’s not shy but sees no need to rush forward and claim the object of his affection. Things move along at his pace or they don’t move at all. Mr. Taurus has caught some flack for being stodgy, and it’s true that he’s not a risk-taker. However, once committed he is the man to depend on. Mars in Taurus is happiest when providing for his partner and has a healthy appetite for all things physical. These two will form a partnership based on sensual enjoyment. A shared appreciation for the outdoors plus the desire for more of everything will keep them happy. Venus in Sag will urge Taurus on and he won’t mind, initially. Difficulties will arise when Mars in Taurus is pushed past his comfort zone and Sagittarius realizes that he won’t be going on any adventures. He’ll be quite happy to walk in the woods, while she’ll want to hike Mt. Everest. She’ll keep pushing, Taurus will shut down, and Sagittarius will leave with a shrug of her shoulders. This could be the ultimate feel-good relationship, but some serious adjustments will need to be made. Each sign will have to accept that their particular way of doing things is not the only way. Taurus can ground Sagittarius, helping her live in the moment and appreciate what she has. 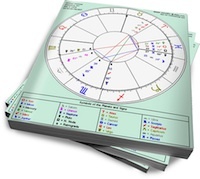 Sagittarius can open Taurus up, helping him see past his set routines. Together they can have more, but only if they give up a little of what they “know” is best. The only piece of the Sag in venus description that I’ve experienced is that Venus in Sag NEEDS to be right, hamming a point home. I feel like if you’re going to start an argument (particularly with your S/O) at least be sure that you have a good chance of winning it. lol I’m actually dismayed by his constant impulse to start arguments or disagreements or discord in areas where he’s not able to back up his stuff. Overall, I think that while you won’t get Venus in Sag to stop the impulsive confrontative behavior, if you’re tenacious…you can temper it. Sexually/Sensually – I think it would work best if the Mars in Taurus were the male and the Venus in Sag were the woman. My advice to other Mars in Taurus dealing with the Sag Venus…give em what they’re asking for…kill em softly…and apologize in as many cycles as they can take. lol They LOVE it enough to keep coming back, but also dislike it enough to give you the much needed space. The post is also right in that Mars in Taurus has a habit of shutting down, but my opinion is that the Sag Venus placement is one worth resisting that urge for. Being in this pairing now, it’s not one that feels like it will last forever and at this point (being the slow mover) I’m not sure that I even want it to. lol This Venus begs for fights…and um…yea…Mars in Taurus…we too often fight to kill. Is arguing foreplay for Sag in Venus people? lol If so, it is the weirdest thing ever….